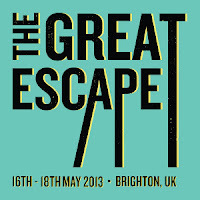 I love The Great Escape, the annual Brighton-based festival dedicated to new music. Indeed, after visiting the festival for the third time last May, I commented that it has "yet again proved to be one of the finest multi-venue, city festivals around." A quote that the festival are even using as one of their testimonials alongside the likes of NME and The Times. I hope to be there again this year, and read on to find out why. The Great Escape has grown into its role as "Europe's leading festival for new music", becoming a legitimate counterpart to the ever-popular but increasingly corporate SXSW festival in Texas. It may rarely share the scorching sunshine of SXSW or the laissez-faire vibe of a Glastonbury but The Great Escape offers hundreds of bands from across the world in a mud-free environment. This is a festival that encourages you to seek out new artists before they hit stadiums, an ethos shared by many a music blog, and this one is no exception. In 2011, I saw BASTILLE play an early, intimate slot and now they're busy clocking up Muse support dates and UK #1 albums. 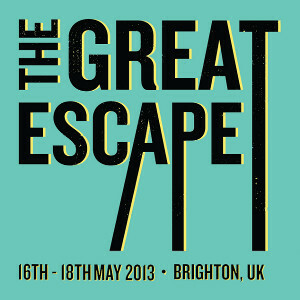 In fact, they're returning to The Great Escape this year as one of the headliners. Adele is another success story from The Great Escape, having played at the fest in 2007. Who'll be this year's BASTILLE and Adele? I don't think anyone knows really but that's half the appeal - stumbling upon so many bands on the rise. You'd suspect that 2013 festival acts like The 1975 and CHVRCHES will go on to bigger things but it's far from guaranteed, although HAIM bolstered their reputation significantly at The Great Escape 2012. The festival has already sold out its entire allocation of regular tickets - however, you can still buy special Dome show tickets to see Billy Bragg or Everything Everything, which also offer you the same perks as a regular three day pass. And considering the cost is a tad over £60, it's not bad at all. If you'd like to sample another angle of the festival then you can opt for a delegate pass and find yourself immersed in the UK music industry as it descends on the convention side of The Great Escape. Here, you can attend panels discussing the future of music retail, the art of A&R, and much more. But really, The Great Escape is more about music discovery - and we'll be highlighting some of our favourite acts on the bill soon. For more details and to purchase tickets, head to mamacolive.com/thegreatescape.